With an impressive showing of local, regional and statewide leaders, Locate South GeorgiaLEADS presented by Electric Cities of Georgia graduated its second cohort in Valdosta-Lowndes County at Quail Branch Lodge Thursday night, March 22. 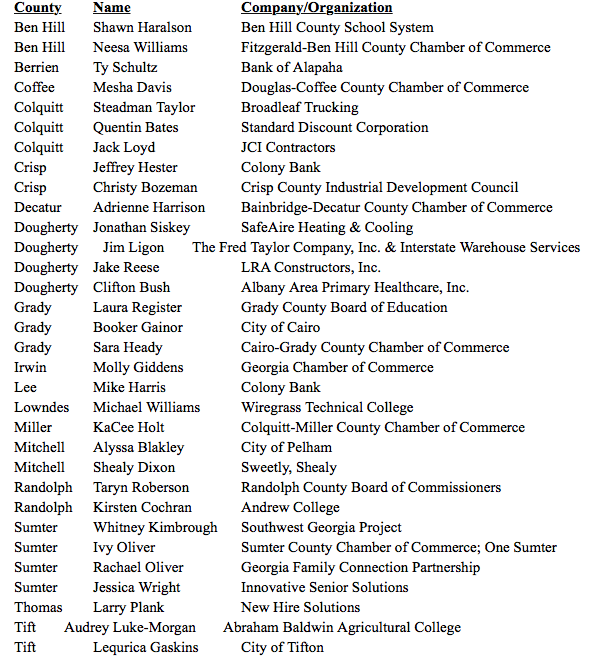 Following an eight-month leadership development experience that covered site visits to seven South Georgia communities and the State Capitol, 31 regional leaders were celebrated and congratulated for their commitment to the region by Lowndes County Commission Chairman Bill Slaughter and Valdosta Mayor John Gayle. The graduation ceremony, sponsored by the Georgia Power Company, was hosted by the Valdosta-Lowndes County Development Authority and members of Locate South Georgia. Colonel Jay A. Vietas, Commander of the 23d Medical Group at Moody Air Force Base, gave the keynote address, sharing insights from Moody’s leadership development initiatives and encouraging graduates to get involved and give back to their local communities. Graduation sponsor, Scott Purvis on behalf of the Georgia Power Company talked about the importance of leadership development as the basis for effective community and economic growth. Director of the J.W. Fanning Institute for Leadership Development at the University of Georgia, Dr. Matt Bishop shared reflections from this year’s program, emphasizing mastery of self, content and others as essential leadership components of Locate South GeorgiaLEADS. With 31 participants representing 21 counties across South Georgia, Locate South GeorgiaLEADS graduates were asked to graduate themselves in a very personal graduation ceremony which included much laughter and poignant moments from their experiences together. Sharing their personal commitments to playing an active role in the future success and growth of South Georgia in the months and years to come, Incoming Chairman to Locate South Georgia, Jason Dunn of the Fitzgerald-Ben Hill County Development Authority challenged graduates to get involved and stay involved as LSGL evolves and grows in the coming years. Announcing the creation of a LSGL Board of Directors to guide the program, Dunn asked both recent graduates and LSGL alumni in attendance to play an essential role in the success and viability of not only the leadership program, but also the region, going forward. Continuing what was begun in 2014 as a “historic regional alliance” for South Georgia, Locate South GeorgiaLEADS’ greatest impact may be in the strength of relationships and networks established to address issues such as community and economic development, future growth and planning, critical land use issues centered around conservation and water and land management, workforce development, education, inclusivity and systemic poverty. LSGL represents a partnership between the regional economic development initiative Locate South Georgia, the state’s premier business organization, the Georgia Chamber of Commerce, and the J.W. Fanning Institute for Leadership Development at the University of Georgia, to identify and develop regional leaders who can elevate the awareness of regional issues of importance across South Georgia—both within their hometown communities, as well as to elected officials across the region and State. The largest regional leadership program in the State, South Georgia is raising the bar for leadership, economic development and civic engagement for existing leaders. LSGL links regional site visits and issue awareness to relevant leadership development content within the framework of the Locate South GeorgiaLEADS priorities. Emphasizing regional priorities throughout the program, each session directly links leadership skills training to issues of critical importance to South Georgia, including regional identity and influence, workforce development, and collective visioning and planning. Sponsors of Locate South GeorgiaLEADS include: Electric Cities of Georgia, AT&T, Webb Properties, Inc., Georgia Power Company, Georgia CEO, Fitzgerald-Ben Hill County Development Authority, One Sumter Economic Development, Inc., and Leadership Worth, and the Sylvester-Worth County Chamber of Commerce. Recruitment for the third year of Locate South GeorgiaLEADS will open in June of this year, with the program to launch in August 2018. Interested applicants may contact their local Chambers of Commerce or Economic Development Authorities, as well as Locate South GeorgiaLEADS Program Coordinator Mary Beth Bass.